As Royal Caribbean designed its new Quantum Class cruise ships, a key initiative was to enhance onboard entertainment and amenities. Consequently, the Quantum of the Seas and Anthem of the Seas ships currently under construction include such “firsts at seas” as a 300ft skydiving simulator, a large sports and recreation complex with bumper cars and a roller rink, and virtual balconies with real-time ocean views on all interior staterooms. The signature venue on each ship, however, is Two70°, a multilevel great room named for its magnificent 270-degree panoramic sea views through vast, floor-to-ceiling glass walls spanning almost three decks at the stern of the ship. A living room by day, Two70° transforms to an entertainment center by night, seamlessly blending live performances with cutting-edge visual technology, highlighted by six ABB RoboScreens attached to a gantry above the main stage. A RoboScreen is a graphical screen mounted to the arm of an ABB articulated arm robot, which creates a unique viewer experience by bringing virtually unlimited, six-axis movement to the video media. Available in various sizes, the Two70° RoboScreens feature six ABB IRB 6620 robots, each holding a 100” diagonal Daktronics LED screen. Housed in the ceiling while not in use, during shows in Two70° the RoboScreens will extend down on the gantry to a position above the stage, displaying unique video and imagery while performing choreographed movements, all custom produced for the specific performance. Developed by Andy Flessas (aka andyRobot) in conjunction with ABB, RoboScreens first gained prominence in 2010 when five large models travelled the globe as main stage props for the Bon Jovi Circle Tour. They have since added visual intrigue to a concert tour by Kis-My-Ft2, a Japanese Pop band; the Las Vegas house show for deadmau5, world famous music producer and performer; and the Ultra-Music Festival in Miami. The RoboScreens being installed on the Quantum Class ships will be the first on any sort of moving vessel. The six Royal Caribbean RoboScreens will provide a high-tech visual enhancement to live performances in Two70°, moving in preprogrammed synchronization to the show’s music and dance. 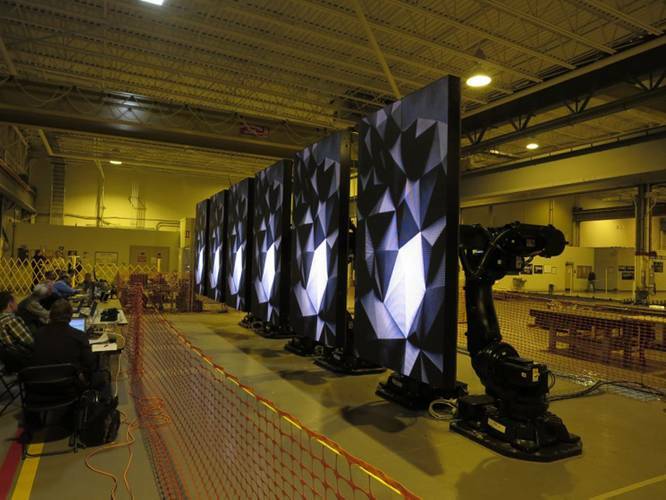 The RoboScreens will periodically assemble in various formations, such as six screens in a row to form one continuous, long screen; a three by two stack to form one big square screen; or a serpentine row, much like a ‘W’ and a ‘V’ strung together. When the screens are together they can display one large cohesive video or image, and when they are apart they can display individual, coordinated images that virtually jump from screen to screen. The combined choreography of screen movement and innovative onscreen display provides an extraordinary accessory to the entertainment experience. The project involves the close collaboration of a number or parties, both within ABB and externally. Being the first installation of an ABB robot on any ship, the ABB Marine Power Group in Helsinki, Finland and the ABB Robotics North American team in Auburn Hills, Michigan worked together for the first time. The ABB PC software team in Gothenburg, Sweden is also involved, working on the programming software and addressing the unique challenges of operating robots at sea. The external partners include Royal Caribbean, andyRobot, Daktronics, Waagner Biro, the gantry provider, Coolux, the video server manufacturer, and Meyer Werft, the shipbuilder based in Papenburg, Germany. 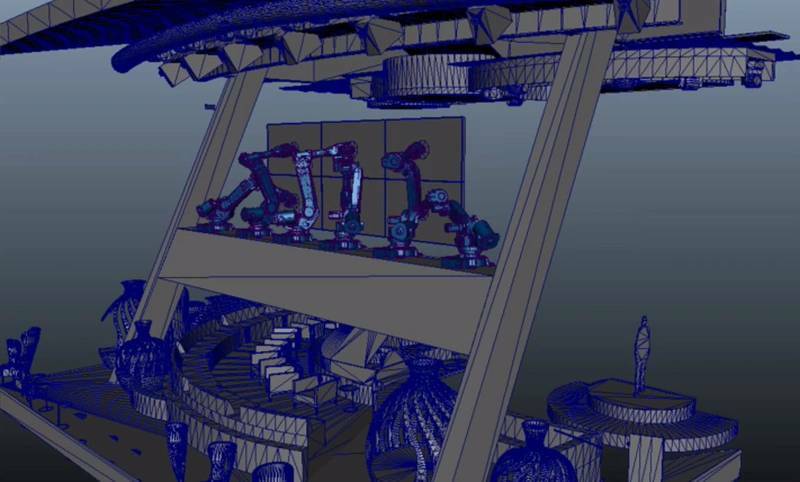 andyRobot and the ABB PC software team collaborated to create a custom developed Show Builder software to allow the various live performance teams that work with Royal Caribbean to easily program the choreographed RoboScreen movements to complement their specific shows. The core of the Show Builder software is a library of preprogrammed choreography building blocks that show producers can select from to model the RoboScreen movements. The library components are created using a Maya-based Robot Animator software package co-developed several years ago by andyRobot and the ABB RobotStudio simulation software team. A show is ultimately produced by selecting building block movements from the library in succession until the choreography is complete. The complexity of the project is magnified by the challenges that are presented by installing robots on a ship, safely withstanding the natural rolling movement and the varying seas the ship will routinely encounter. The Quantum of the Seas is scheduled to launch in November of this year, and Anthem of the Seas will launch in April 2015.